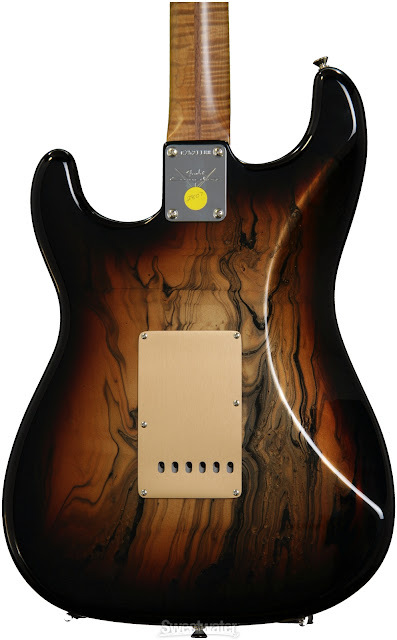 Sweetwater is currently listing this Jason Smith Masterbuild with a "Copper Bowling Ball Swirl" finish, and a cooked flame maple neck. I'm callin' it "Intergalactic Pancake Festival". And what better place to have such a fest than in a very large celestial bowling alley! And who better to be there playing this Strat than B-52's Keith Strickland. I recently had this daydream of mashing up Mesopotamia, Purple Haze and The Beatles' Taxman, while sitting in an IHOP parking lot in a syrup coma with half a cold Starbucks Double Macchiato Vente between my legs. Features & specs include: Large "V" neck with 9.5" radius and 6105 frets, Custom Shop Fat 50's pickups, alder body, COA, candy and OHSC.